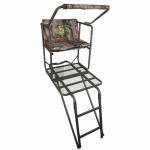 Features -Padded, Flip-Back Shooting Rail -Wide Foot Platform Specifications -HEIGHT: 18’ Tall -FOOT PLATFORM: 36.5” Wide x 12.5” Deep -SEAT: 38” Wide x 12” Deep -STAND WEIGHT: 53 Lbs. -WEIGHT RATING: 500 Lbs. -CONSTRUCTION: Steel -LADDER SECTIONS: 3 x Single Rail -SEAT HEIGHT: 17” -FASTENERS: One 1” Ratchet Strap, Two 1” Stabilizer Straps -SUPPORT BAR: Adjustable -SAFETY HARNESS: Two Full-Body Fall Arrest Systems -MI..
12' portable tri-pod Flex-Tek seat swivels at 360 degrees Folds up for easy Transport Tri-Pod weight: 40lbs Weight capacity: 500lbs NOTE: This item sold In Store Only. .. The 4 steel sections are built with heavy-duty steel, with 3 times the strength of standard 1" square tubing for superior stability. 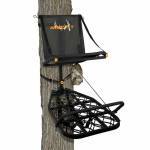 The 22"x16" Flex-Tek Zero-Gravity seat design with 22"x14" tall backrest provides the ultimate in comfort, even for extended hunts. 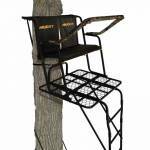 Silencer technology throughout the stand; no metal on metal contact DXT oval tubing; strong, sturdy & easy to grip Quiet, Padded shooting rest and armrests All steel is powder coated with Fiber-Guard Flip-back footrest ..
Muddy The Boss XL Hang-On Treestand. Flex-Tek seat for All Day Comfort! Wide Stance Platform with Fixed Footrest, Seat Flips Back for Full Platform Use CONSTRUCTION: Steel FOOT PLATFORM: 25” Wide x 34” Deep, Fixed Footrest SEAT SIZE: 18” Wide x 12” Deep SEAT STYLE: Flex-Tek, Flips Back SEAT HEIGHT: 22” PACKABLE: Designed to Pack Together with Several Compatible Muddy Climbing Systems (sold separately) FASTENERS: 1-2” Silent Slide Buckle Strap STAND WEIGHT: 20 Lbs. 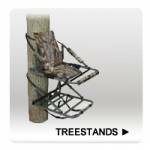 TREE SIZ..
Muddy The Stalker Climber Treestand. Lightweight, aluminum construction folds flat and easily packs in & out. Features a 2X Hybrid climbing chain system with spring bolt knob and one 1" cam-buckle strap. Includes a full body fall arrest harness. Minimum tree size is 9" diameter. Rated for 300lbs. Weighs 15lbs. Non-Slip slats on foot platform Padded armrests & seat bar Nylon netted seat Spring-loaded pin for quick, easy chain adjustments Backpack straps included Accessory bag inc.. 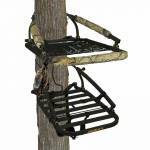 Summit Crush Series Solo Pro Ladder Treestand. 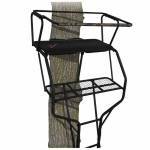 Solo ladder stand features a full length platform for storage and a generously wide seat and padded gunrest so you can stay comfortable longer. Powder coated all-steel construction and 1-year manufacturer warranty. 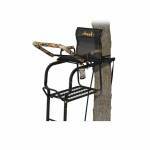 Comes with a complete 4-point safety harness Includes RapidClimb stirrups, all necessary pads, hardware, ropes and straps. Cam lock stabilizer straps Ratchet platform strap Safety / Instrutional DVD Weighs 77lbs 15' to..
Muddy The Partner Double Ladderstand. 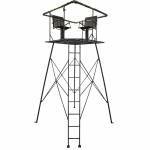 2-Man double ladderstand features a padded, flip-back shooting rail, flip-back seat and extra-wide foot platform. Includes two safety harnesses. Fastens with two 1" Ratchet straps and two 1" Stabilizer straps. 9" Minimum tree size. Rated for 500lbs. Weighs 75lbs. Steel Construction Seat Size: 37" W x 18" D Foot Platform: 40" W x 33" D Seat Height: 20" Backrest: 37" W x 18" H This item Sold In Store Only .. 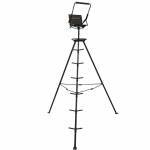 The steel constructed quad-pod measures 12’ tall from the ground to the shooting rail and has an exterior ladder for easy entry. Padded, full surround 34” high shooting rail, carpeted floor, and bungees to secure are only a handful of the features this quad-pod possesses. 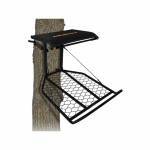 Can be used with or without the camouflage blind, having a 57” shooting width and 70” standing height. Includes blind securing tie-downs. The quadpod weighs 125 lbs and holds a weight rating of 500 lbs. Height 12 Feet.. Extremely comfortable Waterproof, Flex-Tek seat contours to your legs for All Day Comfort! CONSTRUCTION: Aluminum FOOT PLATFORM: 20” Wide x 37” Deep, with Footrest SEAT SIZE: 19” Wide x 11” Deep SEAT STYLE: Flex-Tek, Zero Gravity, Flips Back for full platform use SEAT HEIGHT: 20” PACKABLE: Easily folds for transport, Backpack straps included FASTENERS: 1-1” Silent Cam Buckle Strap STAND WEIGHT: 20 Lbs. TREE SIZE: Minimum 9” Diameter WEIGHT RATING: 300 Lbs. HARNESS: 4-..